So after a few letters and a phone call to the middle of nowhere I found myself in the Northern Territory for a start on a cattle station. I was there from early February, and the wet season was still in force. It was a month before we did any cattle work, and I remember my first day on horseback well. 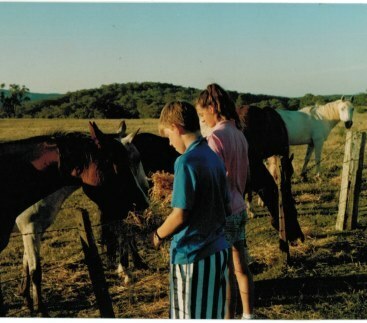 We had mustered horses the day before, which was an experience in itself. Watching 300 odd horses in full flight is something to be seen, especially while you’re hanging on to the back of a Land Cruiser going just as quick. The head stockman knew each one as they came through the round yard to be drafted. He sat on the top rail and called the shots. Each ringer or jackeroo (as I was), had his ‘plant’ of horses; six or ten horses at a time that we were to ride for the next few months, the rest were let back out. As they left the yards they hit a flat out gallop again. The next day was incredibly hot, well over 35 by 6am. I was sitting in the back of a ute which was belting along a dirt road following a horse truck. I had ridden horses a fair bit before and thought I could hold my own. The horse that the boss had picked out for me seemed quiet enough as I saddled him, but he was massive. He had huge feet, and an even bigger head. The older boys had given me a quick lesson on shoeing the day before, and had slapped shoes on him easily so I didn’t think I would have a problem with him. The truck pulled up and we got the horses out. The boss called the helicopter and a few minutes later the thud, thud, thud could be heard in the distance. This was what I came here for; I was lost in the vastness of it all when the boss came over and checked my saddle. “Get on. Keep your feet forward and your weight back, and when you pull him up, ride with Dave”. Well I wasn’t on that horse for long. He dropped his head and I don’t think my bum touched the saddle. As I sat in the dirt the boss was at me to get back on; my horse was just standing there. It took me three more attempts to stay on him. The boys were in hysterics and my brain was a shattered mess. I was so sore and it wasn’t even 7am yet. Thankfully I wasn’t the only one – the place looked like a rodeo, all four jackeroos in a team of 12 were in various degrees of disarray. My horse actually wasn’t that bad, and he was reasonably quiet compared to some my other steeds; he just hated the getting on part. He would buck every time, no matter what. For the next few months my gut would tighten every time I had to get on that horse, so my solution was to get on once. I used to get on in the morning and not get off till we finished late that afternoon. I drank tea on him, ate my lunch, and when desperate, did number ones off the side. I figured risking a bit of wee on myself was a far better option than being speared into the ground. By the time I was finished that day I had not one, but two horse shoe shaped purple welts on my legs, later becoming unbelievable bruises. I also had my first ride in a helicopter to look for my horse after getting off him to get my hat, and I had an IOU to the kitty for $35. $5 for each time I’d come off my horse. In comparison to those days, a few wet days at the markets are paradise. What about you? What was your first job? What did you learn? Are you still doing the same thing?